This profile is based on a copy of General der Panzertruppe Lemelsen’s microfilmed service record housed at the United States National Archives and Records Administration in Washington, D.C. Supplemental sources are listed below. Parents: Major a.D. Max Lemelsen (mother’s Christian and maiden names are illegible in service record). Major Lemelsen last served in Infanterie-Regiment Keith (1. Ober-schlesisches) Nr.22 before retiring from the Army. Frau Lemelsen died on 27 March 1910. Wife: Apparently a bachelor, it is unknown who Luise Lemelson (next of kin) was. Originally an artilleryman by trade, General der Panzertruppe Joachim Lemelsen is perhaps best remembered for his series of army-level commands during the Italian campaign. While a good corps commander and personally brave, Lemelsen was merely an adequate army commander-in-chief, no doubt aided by the largely static and defensive nature of the Italian theater of operations. In Kesselring: German Master Strategist of the Second World War, British author Kenneth Macksey described Lemelsen as being “…of relatively limited intellectual capacity, of whom it had been considered that the appointment of corps commander was about his ceiling.” Indeed, at least one evaluation found in Lemelsen’s service record supports this assessment. Fresh, energetic personality. Clear certain views. A distinguished, open character. Very lively. Fully proven before the enemy. Exemplarily leads his corps in the most difficult situations. Mentally very active and interesting. Physically particularly agile. With no negative observations to report, Schmidt characterized his subordinate as an “above average” corps commander possessed with a clear head in the most difficult situations. Schmidt recommended Lemelsen’s employment as an army commander-in-chief, an opinion shared by Generalfeldmarschall Günther von Kluge, the Commander-in-Chief of Army Group Center. Of note, Lemelsen’s corps had been holding a generally inactive sector of the front since the end of the Soviet 1941-1942 Winter Offensive. During the previous 15 months, the XXXXVII Panzer Corps had conducted primarily anti-partisan and local defensive operations. On the other hand, an evaluation dated 10 November 1943 prepared by General der Infanterie Otto Wöhler, the Commander-in-Chief of the 8th Army, observed Lemelsen proved not very steady in difficult situations and was easily discouraged requiring repeated motivation. Wöhler described Lemelsen as a good comrade and a “fair average” corps commander, but, based on his personality and performance, he was not recommended for the next higher rung of the command ladder, an army commander-in-chief. Wöhler opined his erstwhile subordinate would best be employed by remaining a corps commander. 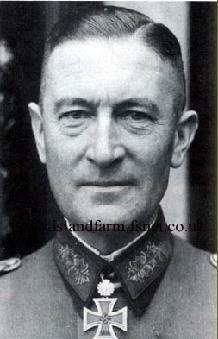 Generalfeldmarschall Erich von Lewenski genannt von Manstein, the Commander-in-Chief of Army Group South, agreed that Lemelsen was not suitable for an army-level command. Since his last evaluation, Lemelsen’s corps had taken part in the Battle of Kursk and, while under Wöhler’s command, seen heavy defensive combat during the German withdrawal to the Dnieper River. Despite this potentially career damaging assessment, Lemelsen had already received temporary command of the 10th Army in Italy only five days before Wöhler’s evaluation was finalized. Following his two-month-long temporary command of the 10th Army (5 November 1943-31 December 1943), Lemelsen’s superior, Generalfeldmarschall Albert Keßelring, noted he adapted surprisingly fast into an army commander. The Field Marshal observed Lemelsen showed a great understanding of the overall situation and displayed personal daring. Keßelring closed the evaluation of his youthful-looking subordinate with the assessment: “Due to his successful leadership activity in the Italian theater, I can judge him fully suitable as an army commander-in-chief.” It should be borne in mind that the 10th Army stood in a purely defensive posture along the formidable Bernhard and Gustav Lines during Lemelsen’s tenure of command. Appointed to command of the 14th Army in Italy in June 1944, Lemelsen was faced with a difficult withdrawal across central Italy to the Arno River. In contrast to his earlier evaluation, Keßelring later wrote in his memoirs that Lemelsen’s army required “special attention” during the withdrawal. The Field Marshal recalled that, with the terrain and enemy forces encountered by his 10th and 14th Armies more or less equal, Lemelsen carried out his orders with more hesitancy and decidedly less energy than that displayed by his counterpart commanding the 10th Army, Generaloberst Heinrich-Gottfried von Vietinghoff genannt Scheel. Although Keßelring later blocked his promotion to Generaloberst, Lemelsen was obviously competent enough to retain an army-level command in Italy for the rest of the war. Easter 1898-Easter 1900: Attended the Royal Gymnasium (High School) at Gleiwitz. Easter 1900-Easter 1907: Attended the Ducal Gymnasium at Blankenburg; attained his certificate of graduation from that institution. 1 July 1907: Entered the Army as a Fahnenjunker in the Altmärkisches Feld-Artillerie-Regiment Nr.40. 1 October 1911-21 November 1912: Detached to the Artillery Firing School at Jüterbog. 3 October 1912-29 July 1913: Detached to the Military Physical Institute in Berlin. 26 March 1914: Adjutant of the II. Battalion of Field Artillery Regiment 40. 6 March 1915: Transferred to Field Artillery Regiment 104 and appointed the Regimental Adjutant. 14 September 1916: Detached to the staff of the 52nd Infantry Division as an Ordonnanzoffizier. 20 September 1916: Transferred to the staff of the 52nd Infantry Division. 26 February 1917: Transferred to a General Staff position in the Oberkommando der Küstenverteidigung or Coastal Defense High Command (Generaloberst Josias von Heeringen). 2 May 1917: While retaining his previous duty position, transferred to a General Staff position in the 21st Infantry Division. 26 July 1917-26 August 1917: Detached to the 1. Nassauisches Infanterie-Regiment Nr.87 to serve as a Battalion Leader. 23 October 1917-19 November 1917: Detached to the 4th General Staff Course at Sedan. 20 November 1917: Transferred to a General Staff position in the VI Reserve Corps. 27 January 1918: Transferred into the Army General Staff. 6 September 1918: Transferred into the Officer of the Army and allocated for special employment to the General Command for Special Employment 18. 20 December 1918: Returned to Field Artillery Regiment 40 and delegated with the leadership of the 6th Battery. 26 February 1919: Appointed Leader of the 3rd Volunteer Battery of Field Artillery Regiment 40. 12 May 1919: Transferred with the 3rd Volunteer Battery of Field Artillery Regiment 40 to Halberstadt. 1 October 1919: Transferred to Reichswehr Schützen [Rifle]-Regiment 7 of Reichswehr-Brigade 4 and delegated with the leadership of the Machinegun Company of the II. Battalion. 1 January 1921: Transferred to the 4th Artillery Regiment as a Battery Officer in the 3rd Battery upon the formation of the new Reichsheer from the Übergangsheer or Transitional Army. 20 May 1921-12 July 1921: Detached to the Artillery Firing Course. 5 August 1921: Transferred to the staff of the II. Battalion of the 4th Artillery Regiment. 1 April 1922: Transferred to the General Staff of the 1st Division. 1 October 1923: Chief of the 8th Battery of the 1st (Prussian) Artillery Regiment. 1 April 1927: Transferred to the staff of the I. Battalion of the 1st (Prussian) Artillery Regiment and detached to the Artillery School at Jüterbog. 1 October 1929: Chief of the 1st Battery of the 1st (Prussian) Artillery Regiment. 1 October 1930: Detached to the staff of Group Command 1 in the Uniform of a Leadership Staff Officer. 1 October 1931: Commander of the III. Battalion of the 5th Artillery Regiment. 1 October 1933: Course Leader at the Artillery School at Jüterbog. 1 April 1935: Commandant of the Infantry School; renamed the Dresden War School on 1 May 1935. 15-22 October 1943: General der Panzertruppe Heinrich Eberbach was delegated with the temporary leadership of the XXXXVII Panzer Corps during this period. 31 December 1943: Deputy leadership of the 10th Army terminated and returned to Army High Command Leader Reserve (Generaloberst von Vietinghoff genannt Scheel resumed command of the 10th Army) – allocated to the General Staff of the Deputy Commanding of the IX Army Corps and Commander of Wehrkreis IX, Kassel. 5 March 1944: Delegated with the deputy leadership of the 8th Army on the Eastern Front for the duration of the absence of the commander-in-chief. NOTE: While this entry appears in Lemelsen’s Dienstlaufbahn or service record, it seems unlikely the posting ever took effect. In Stalingrad to Berlin: The German Defeat in the East, author Earl F. Ziemke describes General der Infanterie Otto Wöhler, the permanent commander-in-chief of the 8th Army, in command during the Soviet Spring Offensive of March 1944. If, in fact, Lemelsen deployed for the Eastern Front, then it seems likely he was there for only a brief period. 1 September 1944: Commander-in-Chief of the 14th Army in Italy. 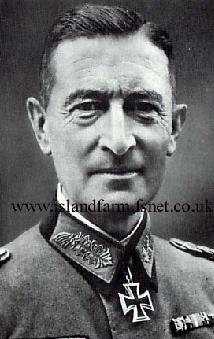 7 September 1944: Generalfeldmarschall Keßelring struck down Lemelsen’s consideration for promotion to the rank of Generaloberst. 15-19 October 1944: Suffering from acute catarrh, an inflammation of the nose and throat, Lemelsen was briefly evacuated from the front for medical treatment. During his absence, General der Panzertruppe Fridolin von Senger und Etterlin, the Commanding General of the XIV Panzer Corps, assumed temporary leadership of the 14th Army. 10 March 1945: Delegated with the deputy leadership of Army Group C in Italy pending the arrival of the newly appointed commander-in-chief, Generaloberst von Vietinghoff genannt Scheel, from Courland. 1960: The divisional history 29. Division, 29. Infanterie-Division (mot. ), 29. Panzergrenadier-Division was published in Germany under the authorship of Lemelsen (posthumously) and Julius Schmidt. Knight’s Cross of the Iron Cross: 27 July 1941, General der Panzertruppe, Commanding General of the XXXXVII Army Corps (Motorized). Oakleaves (No. 294): 7 September 1943, General der Panzertruppe, Commanding General of the XXXXVII Panzer Corps. German Cross in Gold: 15 July 1942, General der Panzertruppe, Commanding General of the XXXXVII Panzer Corps. Prussian Royal Hohenzollern House Order, Knight’s Cross with Swords: 30 October 1918. 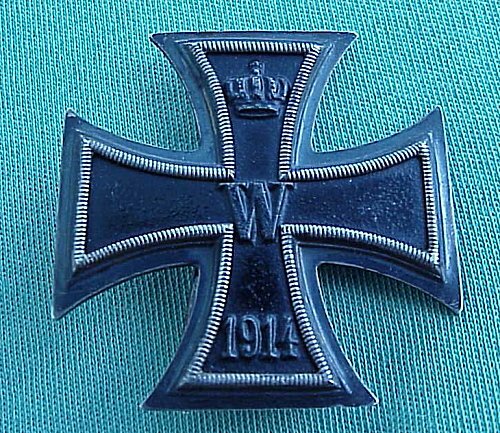 Prussian Iron Cross, 1st Class (1914): 5 December 1916. Prussian Iron Cross, 2nd Class (1914): 21 September 1914. 1939 Bar to the Prussian Iron Cross, 1st Class: 30 September 1939. Medal for the Winter Campaign in Russia 1941/1942 (“East Medal”): 1 August 1942. Hamburg Hanseatic Cross: 14 April 1917. Panzer Assault Badge in Silver: 13 January 1942. 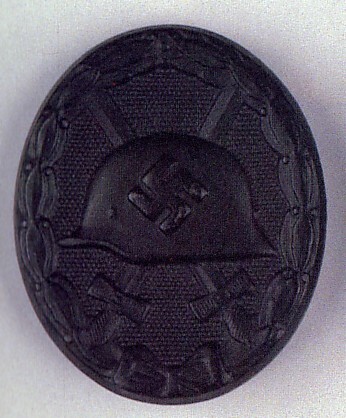 Wound Badge in Black – World War II award: 14 June 1942. 18-19 August 1914: Battle on the Gette. 23-24 August 1914: Battle of Mons. 25-27 August 1914: Battle of Solesmes and Le Cateau. 28-30 August 1914: Combat on the Somme. 6-9 September 1914: Battle of Ourcq. 12-26 September 1914: Combat on the Aisne. 1-13 October 1914: Battle of Arras. 24-25 October 1914: Engagement at Blangy. 14-25 December 1914: December Battle in French Flanders. 26 December 1914-6 June 1915: Positional combat in Artois. 7-13 June 1915: Engagement at Serre. 14 June 1915-22 June 1916: Positional combat in Artois west of Bapaume. 24 June 1916-26 November 1916: Battle on the Somme. 19 January 1917-2 June 1917: Positional combat in Upper Alsace. 7 February 1918-20 March 1918: Positional combat in Artois and deployment for the Great Battle in France (“Ludendorff Offensive”). 21-23 March 1918: Breakthrough battle at Monchy—Cambrai. 24-25 March 1918: Battle of Bapaume. 31 May 1918-13 June 1918: Battle of Soissons. 18 July 1918-25 September 1918: Defensive battle between Soissons and Reims. Kesselring, Albert. The Memoirs of Field-Marshal Kesselring. New foreword by Kenneth Macksey. Presidio Press, Novato, California, 1989 printing (originally published in Germany in 1953 as Soldat bis zum letzten Tag). Macksey, Kenneth. Kesselring: German Master Strategist of the Second World War. Greenhill Books, London, United Kingdom, 2000 printing of the original 1978 edition. Lemelsen, Joachim & Schmidt, Julius. 29. Division, 29. Infanterie-Division (mot. ), 29. Panzergrenadier-Division. Podzun-Pallas Verlag, Germany, 1960. Senger und Etterlin, Frido von. Neither Fear nor Hope. George Malcolm, translator. Presidio Press, Novato, California, 1989 printing (originally published in Germany in 1961 as Krieg in Europa). On 5 October 1941, Panzer Group 2 was redesignated the 2nd Panzer Army (it had also been designated Army Group “Guderian” from 28 July 1941-3 August 1941). On 26 December 1941, Adolf Hitler, acting upon the request of Generalfeldmarschall Günther von Kluge, the Commander-in-Chief of Army Group Center, relieved Guderian of his command. Guderian relinquished command of the 2nd Panzer Army to General der Panzertruppe (later Generaloberst) Rudolf Schmidt. Previously the Commander-in-Chief South, Generalfeldmarschall Keßelring was granted the dual appointment of Commander-in-Chief Southwest and Commander-in-Chief of Army Group C on 21 November 1943. As such, he held overall command of the German military forces in Italy. While the 10th Army defended the breadth of the Italian peninsula, the 14th Army, commanded by Generaloberst Eberhard von Mackensen, was undergoing formation in northern Italy after being activated in early November 1943. Following the Allied amphibious landing at Anzio on 22 January 1944 (Operation Shingle), von Mackensen’s 14th Army headquarters moved from Verona to take command of the German beachhead defenses. On 15 January 1945, Keßelring returned to Italy and resumed duties as the Commander-in-Chief Southwest and Army Group C. On 10 March 1945, Keßelring again relinquished his post to Generaloberst von Vietinghoff genannt Scheel when he was appointed the new Commander-in-Chief West. On 24 November 1944, command of the 14th Army passed from Ziegler to General der Panzertruppe Traugott Herr. In mid-December 1944, General der Infanterie Kurt von Tippelskirch assumed temporary command of the army from Herr who underwent a head operation. 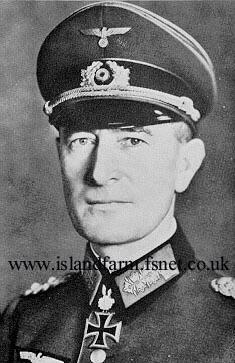 Generals von Vietinghoff genannt Scheel, Herr and von Tippelskirch were all held for varying periods of time at Island Farm Special Camp 11. 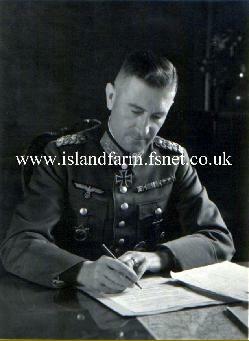 SS-Obergruppenführer und General der Waffen-SS Karl Wolff was held for a time at Island Farm Special Camp 11 after the war. For further information on Wolff’s secret surrender negotiations in Italy, refer to Operation Sunrise detailed in his profile. In addition to the 10th and 14th Armies, Army Group C also controlled Maresciallo d’Italia (Marshal of Italy) Rodolfo Graziani’s Italo-German Ligurian Army, which had guarded the Gulf of Genoa to the Franco-Italian frontier. As of 12 April 1945, the Ligurian Army consisted of the LXXV Army Corps (General der Gebirgstruppe Hans Schlemmer) and the Lombardy Corps (General der Artillerie Kurt Jahn). Generaloberst von Vietinghoff genannt Scheel served as Commander-in-Chief of Army Group Courland on the Eastern Front from 29 January 1945-10 March 1945.